For many, the second half of 2014 will be remembered as the time when police violence against black communities sparked outrage, protest, and calls for change. This is a timely and sorrowful moment for How It Went Down to arrive as a novel about the shooting death of a black teen by a white man. 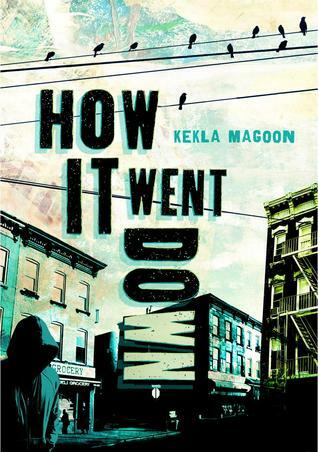 Thankfully, Kekla Magoon handles the plot and characters with delicacy and enough nuance that the book may become a helpful way for some teens to begin to process their frustration and confusion. It’s important to note though, that How It Went Down is deliberately evocative of the death of Trayvon Martin, even though it’s possible to draw some parallels to Michael Brown’s death. It’s also important to note that Magoon doesn’t just recreate the plot beats of Trayvon Martin death; she’s not interested in a “ripped-from-the-headlines” kind of storytelling. She’s asking a lot of questions. How does a community cope with loss? When that loss is indicative of a larger social justice issue, how does that individual’s life become mythologized and/or demonized? How does tragedy connect and divide the people closest to it? Told from multiple perspectives, the novel unfolds in “real time” beginning with Tariq Johnson’s death and following the subsequent week. Many characters are introduced in the first 60 pages. It’s an overwhelming amount of information and disorienting. I had to note each new character just to keep everything straight in my head. The confusion is appropriate for the beginning of this story. In the immediate aftermath of the shooting it’s difficult to figure out what’s just happened and like the characters, the reader should feel wrong-footed. Magoon is showing that even with eyewitness accounts from all involved, it’s very hard to know the whole story of “how it went down.” The downside to this structure is that the pacing is rough, because it changes with each change in voice. (The voices are differentiated mostly through characterization, but grammar and vocabulary also help distinguish the individuals. Tariq’s sister, Tina, expresses herself in verse.) When almost every chapter resolves an idea or individual’s thought, it’s hard to feel momentum. Magoon is looking at the micro and the macro effects of racially biased violent crime by using a large variety of voices to tell a single story. We hear from witnesses, friends, family, neighbors, and even a opportunistic politician. The effect is an intimate experience of tragedy with the ability to see the gestalt of the situation. Tariq’s friend, Tyrell is shaken not only because he’s lost his friend, but because it will now be harder for him to avoid the neighborhood gang without Tariq by his side. A girl who tries to save Tariq after he’s shot realizes that she wants something different out of life. The politician, Reverend Alabaster Sloan, recognizes his self-serving motivations even while he genuinely wants justice for Tariq. Through their voices we also learn that the white man who shot Tariq has not been charged with any crime and no one has seen him since the police let him go. There are vigils and protests that bring the community together, and there is endless media coverage. No one, not even the eyewitnesses, is really sure what happened the afternoon that Tariq was shot. Was he fleeing after robbing a corner store? Did he have a gun or a Snickers bar? Was he a gang member or a good son and student? After wading through these muddy waters of many voices and perspectives, Magoon demonstrates that the “truth” about Tariq is irrelevant. As an individual, his death is felt deeply by his family and friends who loved him; whether he was good or bad won’t change the fact that he’s gone. And it won’t change the fact that the police investigation into Tariq’s death treats him like a guilty suspect while the man who committed the crime is free to hide. How It Went Down is powerful and an important book to share with teens. Although it’s not a perfect novel, there is definitely a lot to discuss here, particularly because Magoon raises such difficult, thorny issues and doesn’t try to offer any easy answers. Agree 100%. I just finished it a few days ago. I thought it was a little cluttered, but the book was a solid win for me, because it was meaty and brought up a lot of interesting perspectives. I loved how the ripple effect of violence in a community was really highlighted.